Connecting your opportunities to LinkedIn – How Do You Use VolunteerMatch? Through our partnership with LinkedIn for Good, skilled volunteer opportunities posted on VolunteerMatch.org will automatically be posted to the LinkedIn Volunteer Marketplace as well! This gives organizations looking for skilled volunteers direct, easy access to LinkedIn's online network of 500 million professionals. 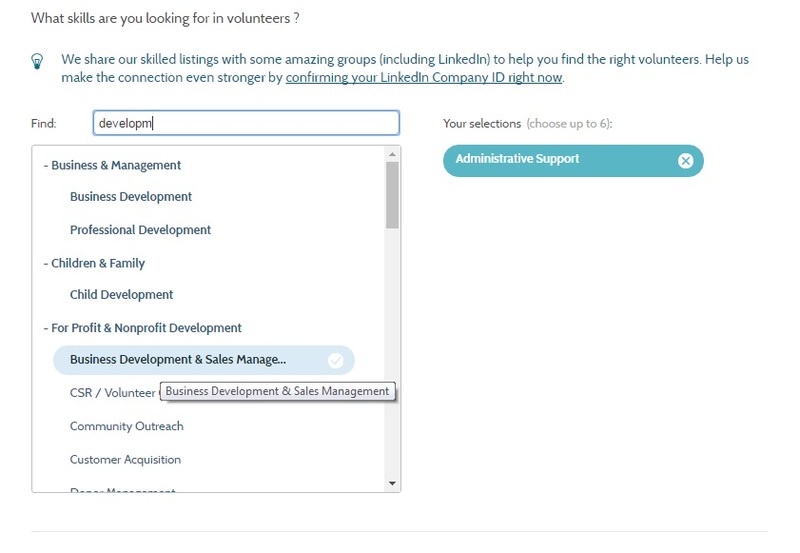 By adding your organization's LinkedIn company page URL to your VolunteerMatch account, your opportunity on VolunteerMatch will be connected to your organization's LinkedIn company page. If you do not add your organization's LinkedIn profile URL, the listing will be connected to the VolunteerMatch LinkedIn profile page. So we recommend putting in your own URL! You'll need to enter the URL corresponding to your LinkedIn company page. You can find this URL by going to linkedin.com, searching for your company name, selecting your company from search results, and copying the URL from the address bar (e.g. http://www.linkedin.com/company/22503). You can enter your company URL into the 'LinkedIn URL' field while registering your organization or, if you already have any organization account, by editing your organization profile on VolunteerMatch. Post an opportunity! When you post a new opportunity on VolunteerMatch, you can select specific skills that you're looking for in a volunteer. Select all the skills that apply from our Skill Library. Please Note: only opportunities with skills and descriptions more than 100 words will be posted on LinkedIn. Non-virtual opportunities need to have a city, state and ZIP in order to successfully post on LinkedIn. If you aren't sure if your opportunities have skills entered, you can edit them to find out and add any new skills relevant to the opportunity. When you finish the opportunity and it goes live on VolunteerMatch, we'll send it to LinkedIn to be posted in their Volunteer Marketplace the following day. When a volunteer wants to express interest or get more information about your volunteer opportunity on LinkedIn, they'll be directed to the original posting on VolunteerMatch. All of your volunteer connection notifications will continue to come from VolunteerMatch.